Let’s all get real clear about one thing: It is Mike who is building the refrigerator system on Galapagos. In his post on Reefer Madness Mike consistently used the prounoun ‘we’ to refer to all the work being done on our boat. In Mike’s case, he doesn’t generally refer to himself in the plural form as though he were royalty. Mike is not known to say things like ‘Take us to the royal bed as we are tired.’, or ‘We disagree with the lowering of taxes on the masses as we love our money.’. No, he may speak the ‘Queen’s English’ as a rule, but he doesn’t generally speak as though he WERE the Queen. Or King. Or whatever. Mike aboard S/V Elsa took this shot of us as we passed each other out on the bay. So I can only assume that his use of the collective term is meant to somehow imbue me with a sense of having participated more than I actually have. Or perhaps he is using the term the same way people do when the woman has given birth. You know, as in ‘WE had a baby’. Well, NO, ‘WE’ did not. The woman had the baby and you, pathetic man, stood by and watched with helpless awe and wonder. You got to be there for the fun part before, and the fun part after, but the actual growing and birthing of the child? Not so much. And don’t you forget it! So let’s get real clear about the fact that it is Mike’s job to build this baby. My job is to stand by and watch with pathetic awe and wonder, my jaw usually on the floor. My how our roles have reversed in the last 30 years. I got this photo of S/V Elsa on a beautiful winter sailing day in February. Could there BE a more perfect name for this boat? If blogs are good for anything it is meeting other like-minded people. We have met a number of great folks through our blog, most of whom live nowhere near us. 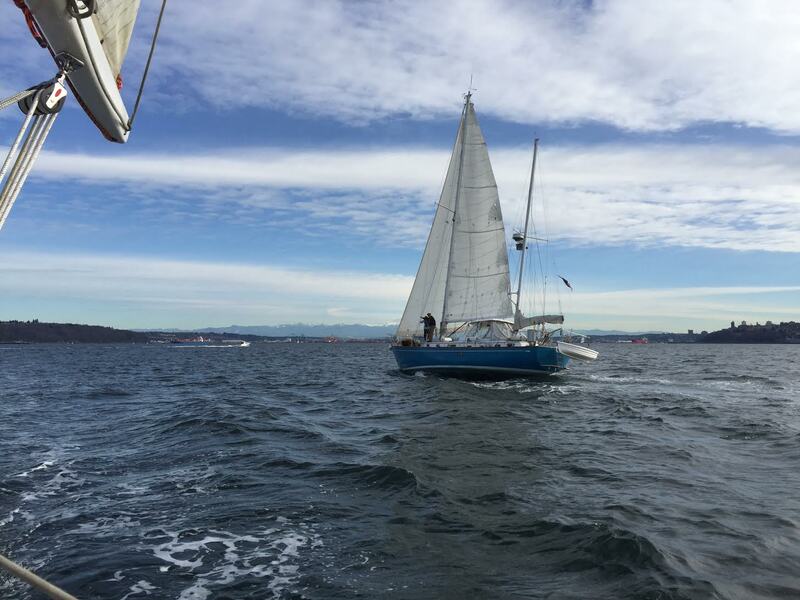 S/V Elsa’s people, Michael and Kristin, live in Kirkland and keep their boat in Tacoma at Hylebos Marina, where we used to haul out Moonrise, our old Cal 34. Kristin contacted us through our blog late last year and we arranged dinner together. It was great to see them again this year, hear about their new precious grand baby, and finally swap boat viewings. Bronze samson posts. 100% saucy. Elsa is a 1974 Ingrid 38 and Michael and Kristin are the third owners. They bought her from someone who had loved her well, started a lot of projects, then had to sell before seeing them completed. Fortunately for them, he left the boat full of brand new parts and pieces of beautiful wood to finish the old girl. Michael and Kristin, like all old-boat owners who love their vessels, have found a project to fill their hearts and their days as they finish what the previous owner started. Michael’s goal with Elsa is to have a vessel with simple systems that sails beautifully, staying as true to the classic ways of this lovely boat as possible. Apparently owning a boat like Elsa has been a lifelong dream of Michael’s. He’s living the dream! The previous owner made this block himself. He left a box of them on the boat. Stepping aboard Elsa you can feel her solid structure under your feet. She rides in the slip gracefully, no jerky movements to put you off balance and plenty of room to move around. In fact, the Ingrid 38 is designed to be sea-kindly and to sail well in rough seas. Originally designed to be a wooden boat, she has the salty look of a much older sailing vessel. It’s really so lovely to just be able to ‘step’ aboard a boat rather than climb aboard as you have to do with Galapagos. Different boats, different compromises. At 38 feet, Elsa is just right for a couple who wants to do coastal cruising in this area and she is built for off-shore sailing in mind so they have the perfect ‘go anywhere’ boat for two. All new opening ports, added by the previous owner. Wow! Like all ‘new’ boat owners, Michael and Kristin have a number of little projects and plans for their girl, but they are also dedicated to sailing her as much as possible. Between sailings there are plans to paint the deck a different color of tan, change the boot stripe color to a pale grey, and they receive their mainsail with new strong track attached this week. We are envious of that little addition to their sailing system and will be keeping a gimlet eye or two on how that performs for them. I get the impression that it is sailing first, boat work second. In the photo above, note how Michael solved the problem of adding winches to his mast without drilling extra holes in the hollow wooden spar. Since the spar is painted, he cannot tell for sure what’s underneath the paint except to know that it is a hollow wooden box, many feet tall. He wanted winches, but not holes. So he had these steel brackets fabricated and mounted the winches onto wood boards. These can be easily removed to make sure moisture is not causing trouble underneath the wood. He also had that bar for the staysail fabricated to allow it to move freely as needed. Sweet. Elsa’s Volvo engine is accessed through this hobbit door behind the entry steps. For a 38 foot boat, the engine space is generous and I enjoyed Michael’s description of how he would lay down a tarp and ‘swan dive’ into this space, being careful of the crunchy bits against soft flesh. I believe he may have shed a tear or two when beholding Mike’s engine room aboard Galapagos, but hey, you buy a 47 foot boat and you, too, can have an engine room. We all have our trade offs. Two guesses what this is. V berth on the Ingrid 38. Kristin and Michael are planning to remodel this area. We will be watching closely. Photo credit to their blog. So she is looking at a remodel of the salon to make cuddling up easier, and create a space for them to sleep more comfortably. I understand her pain. It seems we both have a certain type of space in mind, and while we agree that we understand sailing and safety systems come first, our desires will not be thwarted forever. Stay tuned for updates to all of that on our mutual blogs. New sinks, countertops, and faucet. Their galley is adorable and functional. The previous owner put in a new sink and faucet, lined the icebox with nice formica, and resurfaced the countertops. These are all projects that will be happening aboard our boat, too, so I was extra curious about this area. It’s really a lovely space. He maintained the feel of the interior and kept the surfaces easy to clean. Notice the sink is not yet plumbed, but all the stuff is there waiting to be put in place. Here are a couple more shots. Really nicely done ice box. Love that easy-clean area on the bulkhead behind the stove. Notice in the photo above you can see that the previous owner added insulation to the boat, at least above the waterline. Ok, I am dead jealous of that. For extra coziness on those wet winter days. Kristin and Michael have a blog you can follow to watch Elsa’s progress as they complete the myriad projects they have in the works. She is already a beautiful vessel and has obviously been well-loved. By the time they are ‘finished’ (HA HA HA) with her, she will be the Queen of Commencement Bay. ‘We’ will be pleased for them. This entry was posted in Galapagos, Sailboats, Sailing, Uncategorized and tagged Sailing, Sailing community by Melissa. Bookmark the permalink. You GUYS! You rock! Great fun to have real boat tours after so many virtual ones. We can’t wait to see Galopagos outfitted and ready for your adventures! So much fun to see Elsa and write this up!! Looking forward to seeing you two again. What kind of sail rig is that on Elsa? Have never seen a sailboat with that one before. Very interesting tour and much enjoyed. Saw Elsa on Commencement Bay two weeks ago and asked what kind of a yacht see was. Beautiful! I’m considering the purchase of a partially finished Ingrid hull. Would love a tour to take a look. Elsa is a lovely boat and I’m sorry to say a bit faster than Galapagos in a light breeze. I will pass on your comment to the owner along with your email address and he can contact you at his leisure.